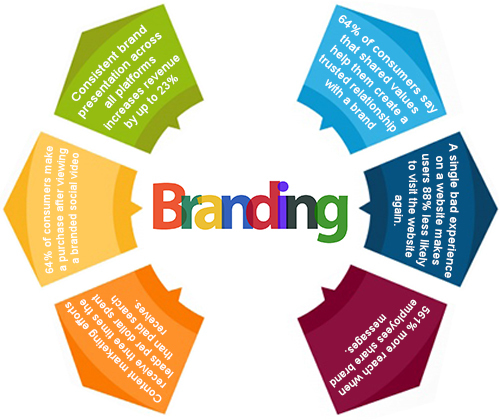 Branding is everything – it’s who you are and what your business means! Your brand is your unique identity and it is the epitome of your reputation. We know that you treat your business just like you would treat your child and we assure you that we will care for it just as much, if not more. Branding allows you to put forth what your business values and what it actually stands for, allowing you to connect with your customers. Leave us the responsibility of creating a brand image that will not go unnoticed and further maintaining your digital presence. Consistent brand presentation across all platforms increases revenue by up to 23%! If you would like to understand where your brand stands in the market then get a free report on your user engagement. Get a simple brand audit done today and get an analysis with numerous ways to improve your website performance. Brand building is not done overnight and it requires systematic strategizing and regular follow-ups. Brand building is a step by step process that needs to be strategized according to your business requirements while keeping in mind your target audience. After establishing the brand, it is vital to keep up with the current trends through follow-ups to stay at the top of the market. Think of it as a re-birth of your brand. Re-branding means to restart the branding process from scratch and laying a strong foundation for your business to build on. It is inclusive of auditing past engagement and finding out what works for your business and strategizing and optimising an effective branding process. Your brand is your unique identity and it is the epitome of your reputation. We know that you treat your business just like you would treat your child and we assure you that we will care for it just as much, if not more. Leave us the responsibility of treating a brand image that will not go unnoticed and further maintaining your digital presence. Branding is not a one-time process. You have to mould your brand to suit the ever-changing trends in order to connect with your audience. Consistent brand representation can inrease your revenue by up to 23% if done right. Given its vitality, managing a brand takes a team, and we are here to take care of that. Our job does not end with making and plan and it’s execusion, we go a step ahead and tap into the resources that arise from implementing branding mechanisms. We provide you with regular reports and analysis based on your engagement so as to keep you in the loop. We care for your business too!